The sewing website that I like, Pattern Review, has it's 12th birthday on November 9th. So a few gatherings were planned in various locations around the world. One was here in Massachusetts, where the founder of the website lives. 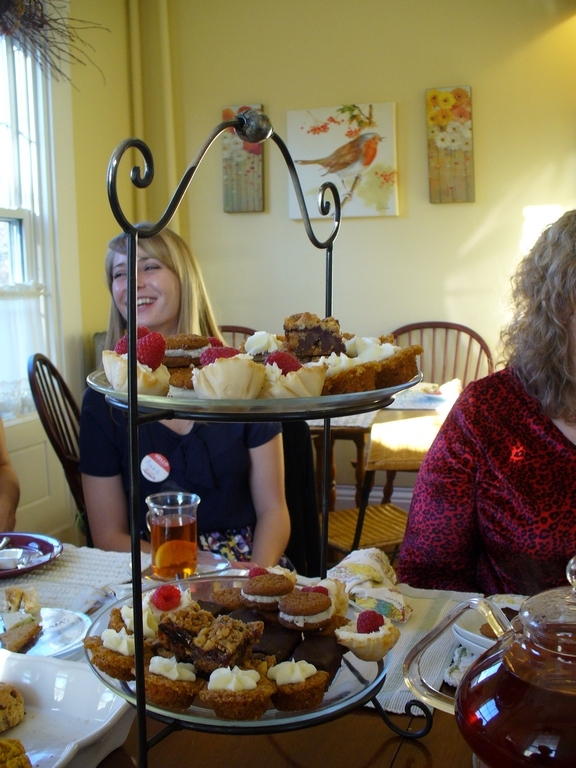 The gathering was a tea party. 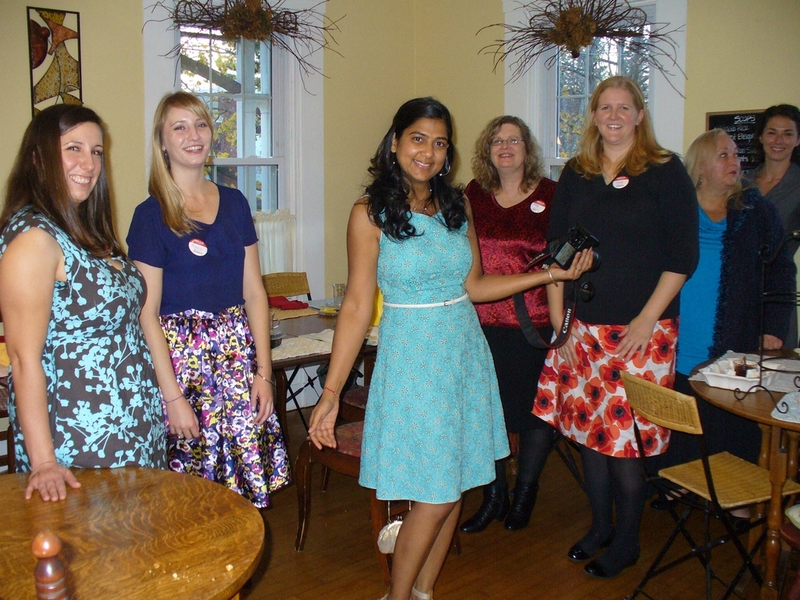 A few of us met at SpecialTeas, a tea house in Northboro. Unfortunately, I don't have many pictures to share with you, because when the waitress took a picture of the group for me, she turned off the flash and I didn't notice. So most did not come out! But I can show you a few and tell you about the tea house. SpecialTeas is in a former residence that now has a couple businesses in it. They have a variety of teas, although surprisingly no Chamomile! For our gathering, we ordered a regular and a decaf tea. The tea is served in glass teapots, that sit on bowls with a tea candle inside. 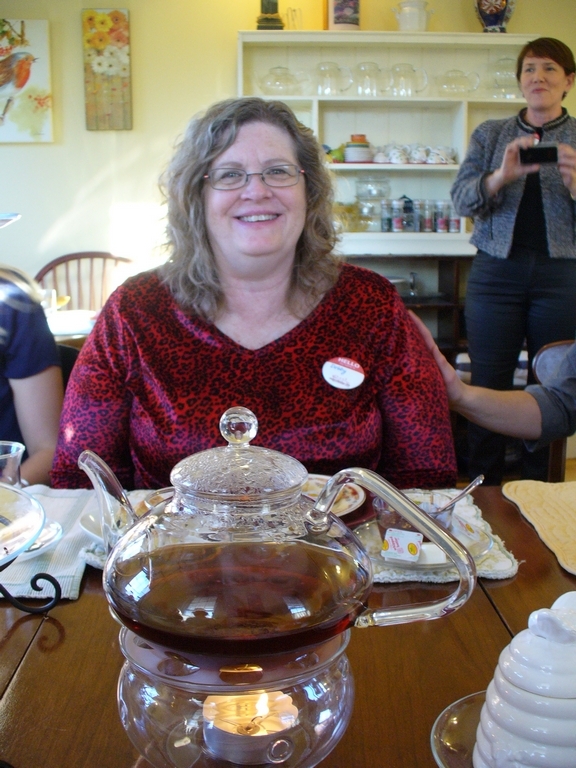 Here is a picture of a teapot, and one of the other people at the gathering. Then they brought out little tea sandwiches. As small as the little sandwiches were, there were also a lot of them. One was cucumber, one was tomato, one had turkey, and I can't remember what the other two were. 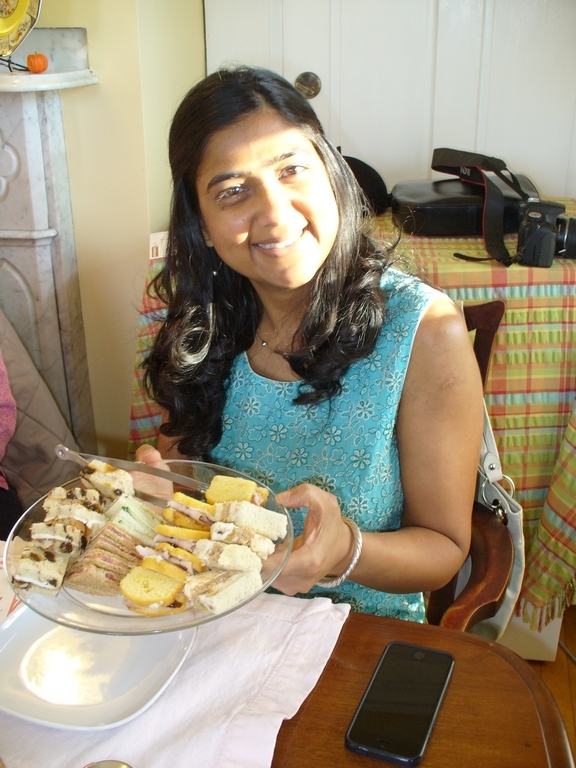 This picture is of Deepika, the website founder, holding one of the plates of sanwiches. We then had small scones, one pumpkin and ginger, and one cinnamon. They then brought out a dessert tray with a variety of things to try. Everyone was wearing at least one thing that they had made, and we had a little show & tell at the end of the gathering. 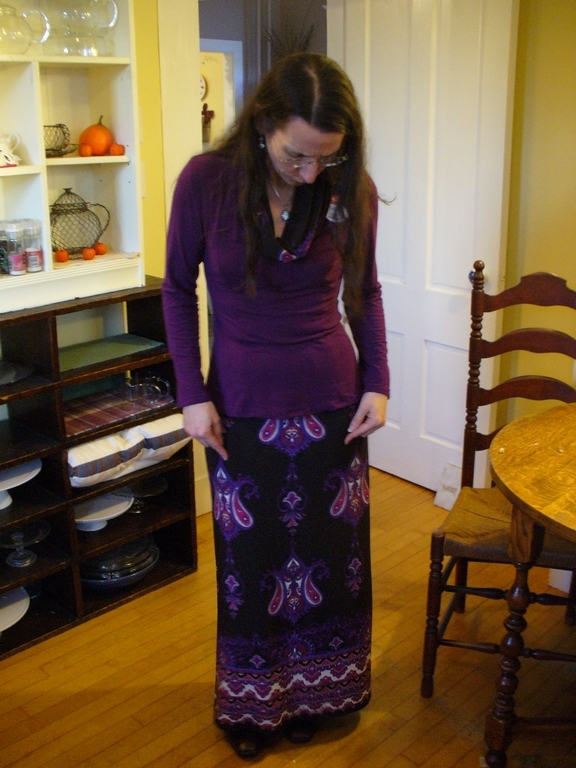 Here are 2 pictures of me, not very good because of the flash issue, wearing the shirt, skirt, and scarf that I had made. 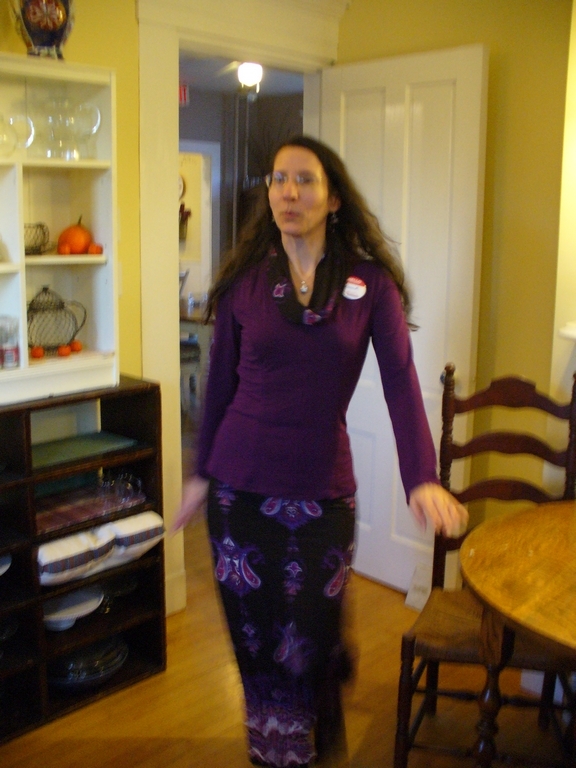 I was 'walking like a model' in case you are wondering about my funny stance. And finally, here is a picture towards the end of the gathering of some of us. By this point, I had the flash back on.